In this study we compare outlier loci detected using a F ST based method with those identified by a recently described method based on spatial analysis (SAM). We tested a panel of single nucleotide polymorphisms (SNPs) previously genotyped in individuals of goat breeds of southern areas of the Mediterranean basin (Italy, Greece and Albania). We evaluate how the SAM method performs with SNPs, which are increasingly employed due to their high number, low cost and easy of scoring. The combined use of the two outlier detection approaches, never tested before using SNP polymorphisms, resulted in the identification of the same three loci involved in milk and meat quality data by using the two methods, while the F ST based method identified 3 more loci as under selection sweep in the breeds examined. Data appear congruent by using the two methods for F ST values exceeding the 99% confidence limits. The methods of F ST and SAM can independently detect signatures of selection and therefore can reduce the probability of finding false positives if employed together. The outlier loci identified in this study could indicate adaptive variation in the analysed species, characterized by a large range of climatic conditions in the rearing areas and by a history of intense trade, that implies plasticity in adapting to new environments. Population genomics relies on the principle that loci across the genome are influenced by genome-wide evolutionary force, whereas selection is locus-specific and imprints a particular pattern of variability only on linked loci [1, 2]. Increasing attention has been put in understanding what proportion of a genome or which genes are being shaped by selection. Directional (Darwinian) selection can leave a set of signatures in the genes under its influence, such as the rapid divergence of functional sites among species and the depression of polymorphism within species. On the basis of these signatures, it is possible to identify genes or chromosomal regions which are likely targets of positive selection [3, 4]. This is achieved by comparing all the loci across the genome that respond similarly to demography and neutral history of populations with outlier loci that show patterns of variation that deviate from the rest of the genome. Identification of outliers is important for two main reasons: i. such loci are potentially under selection and could be a sign of adaptive variation; ii. they could also bias estimates of population genetic parameters such as gene flow, population size and structure, and therefore should be excluded from these analyses. However, selected loci could be used in studies to better understand adaptation or to plan conservation-management strategies . The identification of genes that have undergone positive selection is an important step in understanding how populations have adapted to environmental changes. Such studies are increasingly widespread [6–10] and their application to livestock species can also reveal insights on their selection history. Aberrant behaviour of a locus can range from having exceptionally high or low F ST between populations, to having an excess or deficit of low frequency alleles in a population . Several statistical methods, in which loci candidate for selection are identified in the extreme tails of empirical distributions, have become a widely used strategy in genome-wide scans for selection [11–17]. However, several studies pointed out important methodological conditions to ensure the correct application of these methods  or stressed their lack of power [19–21]. F ST statistic can be used to assess if the variation of SNP allele frequencies among populations leads to signatures of selection [2, 22]. If F ST is determined only by genetic drift, all loci across the genome are affected in a similar way. In the presence of locus-specific selection pressure, deviation in F ST values is observed in selected loci and in linked genetic markers. See Table 3 for SNPs showing simulated F ST. In this study we want to compare outlier loci assessed using a F ST based method  with those identified by a recently described method  based on spatial analysis (SAM). In the original paper Joost et al. tested the efficacy of SAM against F ST based methods using AFLP and microsatellite data from two different species, showing a strong correspondence between the two approaches . SAM is an implementation of logistic regression resembling the method applied by Jump et al. to plant populations with AFLP markers ; but it is used in an explorative way rather than for the confirmation of working hypotheses [8, 24] and therefore the processing of all possible univariate association models between all environmental parameters and the presence or absence of all single alleles is carried out. Here we evaluate how F ST and SAM perform with a different kind of marker, single nucleotide polymorphisms (SNPs), which are increasingly employed due to their high number, low cost and easy of scoring. Besides, SNP can be found inside gene candidates for artificial or natural selection and therefore they might be more informative for this purpose rather than neutral or random markers, like microsatellites and AFLPs. We analysed goat breeds of southern areas of the Mediterranean basin (Italy, Greece and Albania) sampled in the context of the European ECONOGENE Project http://www.econogene.eu using a set of SNPs previously described . See Table 2 for Breeds analysed, country of origin and their sample sizes (N). Six alleles at five loci (Lipase, Casein Alpha S1, Interleukin 2, Integrin Beta-1 and Growth Hormone Receptor) out of 27 were found to lie outside the 95% confidence region of the conditional joint distribution of F ST and mean heterozygosity (Figure. 1) by F DIST2 analysis. They are potentially under selection (P < 0.05) (Tab. 3). Plot of F ST against heterozygosity for the 27 SNPs analysed. Distribution of FST values as a function of the within-population heterozygosity (HS) based on the 27 goat SNPs analysed. The envelope of values corresponds to neutral expectations (with FST = 0.078) in the infinite-allele model constructed according to the method of Beaumont and Nichols , with a confidence level set to 95%. 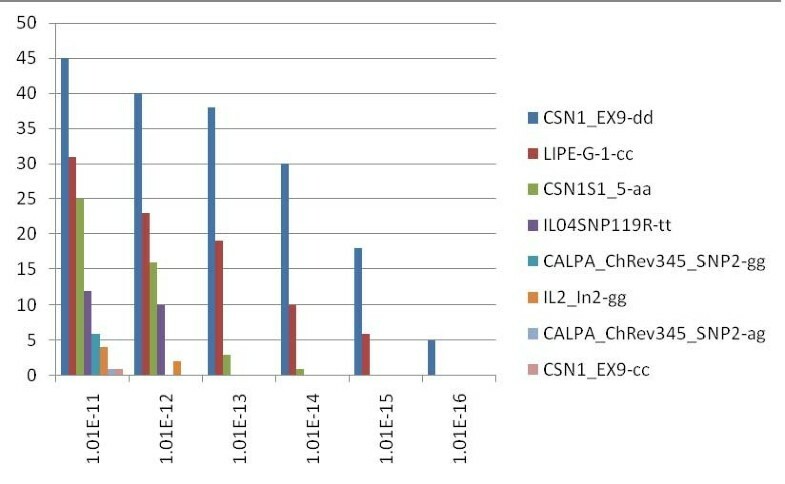 With a significance threshold (ST) set to 95% (corresponding to P < 5.04E-06), SAM detected 16 loci associated with at least one environmental parameter, among which 3 are also identified by F DIST2 (LIPE, CSN1S1-5 and IL2_ln2). Conversely, Integrin beta-1 and Growth Hormone Receptor, identified by F DIST2, are not detected by SAM at any confidence level, and are not associated with any environmental parameter. With a ST of 1.01E-13 (confidence level of 99.99999999%, Bonferroni correction included,), SAM identified 3 alleles at 2 loci (CSN1S1 and LIPE) to be significantly associated with at least one environmental variable. Of the two SNPs analysed in CSN1S1 gene, one (CSN1S1_ex9) is involved in 38 significant models and is associated with 7 among 10 "families" of environmental parameters (duration of sunshine between may and September; relative humidity in January, May to September, and December; number of days with > 0.1 mm rain per month from may to September, and the yearly mean; temperature from April to September; precipitation from June to September; diurnal temperature range from march to December, and the yearly mean; number of days with ground frost per month from March to November, and the yearly mean). The second SNP in CSN1S1 (CSN1S1-5) is associated with 3 environmental parameters which are relative humidity in May, the number of days with ground frost per month in April, and diurnal temperature range in October. Finally, one LIPE allele is associated with relative humidity from May to September, the coefficient of variation of monthly precipitation in March, diurnal temperature range from March to December, as well as with the yearly mean, and with wind speed from April to May (see Figure 2). Plot of significant association models between alleles and environmental parameters. Histogram of the number of significant association models between genotypes and environmental parameters according to the 6 highest significance levels (Bonferroni correction included) in the analysis. From 1.01E-13 or a confidence level of 99.999999% only CSN1S1 and LIPE are significantly present. Names of environmental variables are listed in the text. Names of loci in the legend are followed by the genotype  associated to the models. One CSN1S1_ex9 allele is the unique involved in the 5 most significant models (1.01E-16 Bonferroni correction included). At this level of significance, it is associated with relative humidity in July and August, with the number of days with > 0.1 mm rain per month in August, with precipitation in August, and with the number of days with ground frost in April. Rapid adaptation to environments is expected to have shaped at least some of the genetic diversity in marginal European goat breeds . We thus expected that evidence for divergent selection should be detected in goat breeds, as a response to human and environment mediated selection and to migration history . Outlier approaches, in which genes potentially under selection are identified in the extreme tails of empirical distributions, have become a widely used strategy in genome-wide scans for ascertaining selection signatures [11, 14, 16, 17]. Most studies have been conducted using neutral or random markers, like microsatellites or AFLP, however the increasing use of SNPs as a genetic marker due to their rapid discovery rate provides the opportunity to identify genome-wide signatures of selection, as shown in humans [27, 28]. There is potentially little power to detect outlier loci when examining populations in pairwise comparisons with biallelic markers . On the contrary, in multi-population analysis the variability in F ST among loci is reduced facilitating the detection of outlier loci . Lao et al. have shown that the frequency distributions of SNPs with ability to detect geographical population structure are most likely shaped by local positive selection rather than by genetic drift. The set of SNPs used for this study have been proven very efficient in detecting geographical patterning (Pariset et al, Population analysis of goat breeds from Italy, Albania and Greece reveals precise geographical patterning. Manuscript in preparation). By calculating F ST and mean heterozygosis as a measure of genetic differentiation for each locus, we have identified six loci at five genes in goat populations, which have been potentially target of selection according to the distribution of their genetic variation. One of them is related to body size and can be easily selected for by man, two are related to nutritional property of milk (CSN1S1 and LIPE) and they can be both selected by man or by adaptive advantage of the offspring. Interleukin-2 is a gene showing evidence for positive selection in mammals  as involved in immune response. The last gene, ITGB1, affects several traits, many of which potentially under selection. Moreover, by using univariate logistic regression analysis with geographical variables, we could identify 3 of the 5 genes ascertained using F DIST2. The combined approach reveals that these three genes are under a selection pressure driven by the environment. One allele at locus CSN1S1 is very significantly associated with relative humidity during warm months (July and August), with the frequency of humidity and of precipitation during a warm summer month as well (number of days with > 0.1 mm rain per month and precipitation in August), and with the number of days with ground frost in April. These conditions (warm, wet) are favourable for parasite number to increase over time. While directional selection tends to reduce within-population genetic diversity and to increase among-population differentiation, the reverse is expected under balancing selection, where gene frequencies tend to some equilibrium that maintains polymorphism. In general, Kelley et al. found that the outlier approaches determine genes that have been targets of positive selection. Hoffman et al. and Minder and Widmer  show that it is possible to find candidates for balancing selection using the Beaumont & Nichols  approach, but it is difficult because the lower 95% confidence limit is typically close to zero . 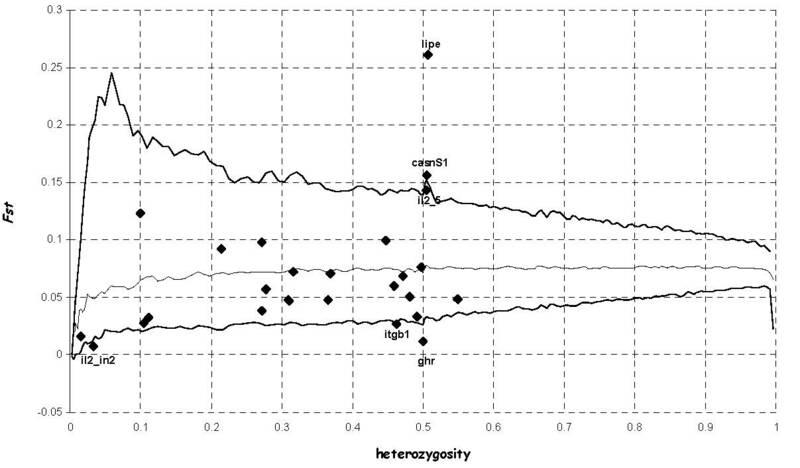 Among the 6 outlier SNPs, 3 of them had F ST values lower than the 99% confidence limit in the F DIST2 test. We hypothesize that balancing or stabilizing selection may be responsible for these outliers, two of which (IL2 and ITGB2) have defence-immunity function. Indeed, genes involved in immunity are affected by balancing selection  and proteins that perform a defence/immunity function present low F ST values . In contrast, 3 loci had F ST values exceeding the 99% confidence limits of F DIST2 and two of them were identified also by SAM. These genes might be important in adaptation to different environments and were probably subject to human selection, as well. SAM is able to identify both loci under directional and in stabilizing selection, but requires the comparison with the results produced by F DIST2 to differentiate the two types of selection, as is the case for IL2. Moreover, SAM can independently validate the F ST outcomes and find correlations wit geographical variables, pinpointing the probable cause of the selection. The population divergence methods implemented in F DIST2 have been widely used in several papers [7, 15, 17, 32] and have been shown to be quite robust by simulations among various demographic scenarios . Setting the same significance threshold, SAM detects more markers than F DIST2 does, but it was shown that when gradually lowering the confidence level in F DIST2, the method was also able to identify those additional loci detected by SAM . SAM's sensitivity is not mastered yet, and further studies will be necessary to establish precise relationships between population genomics approaches and these statistical measures of association. Data appear congruent by using the two methods for F ST values exceeding the 99% confidence limits, more markedly than shown in the Joost et al. paper where microsatellites were used as markers in sheep populations. It may surprise that a high percentage of loci appear under selection, but it should be considered that the loci were purposely chosen for influencing potentially selected traits. Moreover, an active trade of livestock was historically present in the studied area  and adaptation to novel environment should have been crucial for the survival of imported populations. The methods of F ST and SAM can independently detect signatures of selection and therefore can reduce the probability of finding false positives if employed together. The outlier loci identified in this study can be important because they could indicate adaptive variation in the analysed species, which is characterized by a large range of climatic conditions in the rearing areas and by a history of intense trade, that implies plasticity in adapting to new environments. A total of 16 autochthonous goat breeds, originating from Italy, Albania and Greece, were sampled for 30–32 unrelated animals per breed in farms spread over the traditional rearing area of each breed (tab. 2). No more than 3 individuals per farm were sampled to reduce the relationship among animals and to increase the breed representativeness. DNA from a total of 497 blood samples was extracted with a conventional method. Genotyping was performed by K Biosciences (www Kbioscience.com), using Amplifluor™ (Serologicals™) and Taqman™ (Applied Biosystems™) chemistries using twenty-seven SNP markers, as described in Cappuccio et al. . Generally, accuracy greater than 99% was achieved. Quality control criteria were adopted (water as negative control, inter- and intra-plate duplicate testing of a known DNA). Allelic frequency from a total of 13392 genotype assayed was compared to environmental parameters. To detect the effects of selection, the approach used was that proposed by Beaumont and Nichols , further developed by Beaumont and Balding , and implemented in the F DIST2 software http://www.rubic.rdg.ac.uk/~mab/software.html. For each locus, the allele frequencies are used to compute F ST values conditional on heterozygosity and to calculate P-values for each locus. Each simulation included 32 individuals per population, 16 populations, 27 loci and an expected F ST of 0.078. This method provides evidence for divergent selection by looking for outliers with F ST values higher than expected, controlling for heterozygosity . Population datasets were built using 100000 simulations on real data using the coalescent model. Upper and lower confidence limits of 95% quantiles were assumed for conditional joint distribution of F ST versus mean heterozygosity. Loci showing atypical differentiation behaviour (i.e. F ST) and lying outside the simulated neutral distribution are then detected as outliers. The Spatial Analysis Method (SAM) described in detail by Joost et al. is based on an evaluation of the incidence of spatial coincidence, one of the six concepts of spatial analysis distinguished by Goodchild . Spatial coincidence relates the genetic profile of the organisms studied to the environmental parameters measured at the geographic coordinates of its habitat. The data set used for analysis is in the form of a matrix. Each row of the matrix corresponds to an individual and to the geographic coordinates where it was sampled, while the columns contain a) binary information (1 or 0), relating to the status of the genetic marker (for AFLP markers, 1 or 0 respectively indicate the phenotypes « presence of band » and « absence of band »; for microsatellite and SNP markers, the numbers 1 and 0 respectively, indicate the presence or absence of a given allele at the locus in question) and b) values of environmental parameters at the location in question. Univariate logistic regression analysis are calculated by the SAM Program  to determine the degree of association between the frequencies of each allele and the values of the environmental parameters. By calculating the significance of the models generated by all possible pair-wise combinations (allele versus environmental parameter), the markers implicated in the models that emerge as statistically significant can identified. It can be inferred that such loci are likely to influence the process of adaptation to the environment. The environmental information used in this study is comprised of altitude and climatic data. Altitude was estimated with the help of the digital elevation model SRTM30 (Shuttle Radar Topography Mission) developed by NASA, which has a resolution of 30 arc seconds. The climatic data described in Table 1 are based upon grids of 10 minutes of resolution (equivalent to approximately 12 km at the latitude of Switzerland). They are presented in the form of 9 monthly averages and an annual average. These variables characterise continental regions during the time period between 1961 and 1990 . The data have been collected by the Climatic Research Unit (CRU) in Norwich, UK. For this study, monthly variables were separately analysed in order to take account of the seasonality of kidding [40–42]. SNPs showing simulated F ST < sample F ST after F DIST2 analysis. Breeds analysed, country of origin and their sample sizes (N). List of environmental variables considered in SAM analysis. Yearly means and monthly values were used for these climatic variables (a total of 118 environmental parameters). This work has been partially supported by the ECONOGENE project, funded by the European Union (project QLK5-CT2001-02461). The content of the publication does not necessarily represent the views of the Commission or its services. The authors wish to thank Flora Jane Dause for help with the language. Abo-Shehada Mahamoud, Ajmone Marsan Paolo, Al Tarrayrah Jamil, Angiolillo Antonella, Baret Philip, Baumung Roswitha, Beja-Pereira Albano, Bertaglia Marco, Bordonaro Salvatore, Bruford Mike, Caloz Régis, Canali Gabriele, Canon Javier, Cappuccio Irene, Carta Antonello, Cicogna Mario, Crepaldi Paola, Dalamitra Stella, Daniela Krugmann, Dobi Petrit, Dominik Popielarczyk, Dunner Susana, D'Urso Giuseppe, El-Barody M. A. A, England Phillip, Erhardt Georg, Ertugrul Okan, Eva-Maria Prinzenberg, Eveline Ibeagha-Awemu, Ewa Strzelec, Fadlaoui Aziz, Fornarelli Francesca, Garcia David, Georgoudis Andreas, Gesine Lühken, Giovenzana Stefano, Gutscher Katja, Hewitt Godfrey, Hoda Anila, Horst Brandt, Istvan Anton, Juma Gabriela, Joost Stéphane, Jones Sam, Karetsou Katerina, Kliambas Georgios, Koban Evren, Kutita Olga, Lazlo Fesus, Lenstra Johannes A, Ligda Christina, Lipsky Shirin, Luikart Gordon, Marie-Louise Glowatzki, Marilli Marta, Marletta Donata, Milanesi Elisabetta, Negrini Riccardo, Nijman, Isaäc J, Obexer-Ruff Gabriela, Papachristoforou Christos, Pariset Lorraine, Pellecchia Marco, Peter Christina, Perez Trinidad, Pietrolà Emilio, Pilla Fabio, Roman Niznikowski, Roosen Jutta, Scarpa Riccardo, Sechi Tiziana, Taberlet Pierre, Taylor Martin, Togan Inci, Trommetter Michel, Valentini Alessio, Van Cann, Lisette M, Vlaic Augustin, Wiskin Louise, Zundel Stéphanie. LP: designed the study, performed the F ST analysis, and drafted the manuscript. SJ: developed the SAM approach, carried out the relative computations, and formulated parts of the paper. PAM: leader of he Econogene project, provided DNA samples and guidance for the project. AV: participated in developing ideas, in supervision and revision of the manuscript.